(a) Mount the generator assembly in the vise between aluminum plates. 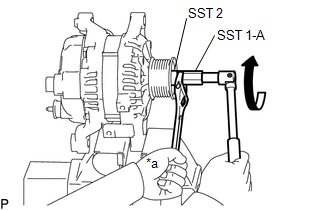 (b) Install SST 1-A to the generator pulley shaft. 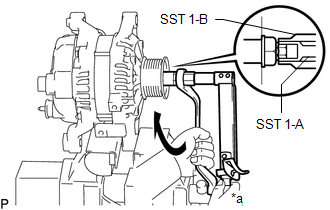 (c) Install SST 1-B to SST 1-A. 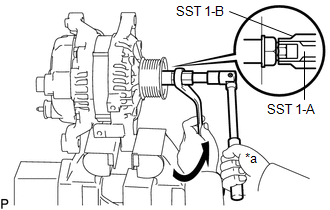 (d) Hold SST 1-A with a torque wrench and turn SST 1-B clockwise with the specified torque. Make sure that SST is secured to the generator rotor shaft. 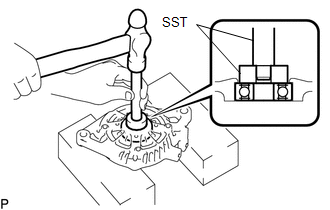 (e) Insert SST 2 and attach it to the generator pulley nut. 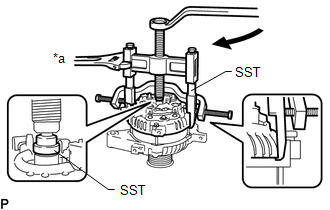 (f) To loosen the generator pulley nut, turn SST 1-A as shown in the illustration. 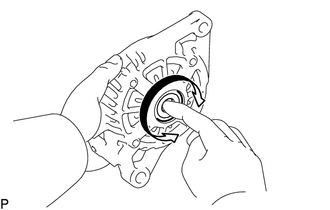 To prevent damage to the generator rotor shaft, do not loosen the generator pulley nut more than one-self of a turn. (g) Remove SST 2 from the generator pulley shaft. 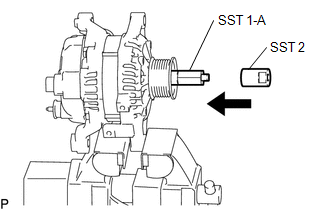 (h) Turn SST 1-B as shown in the illustration and remove SST 1-A and B. 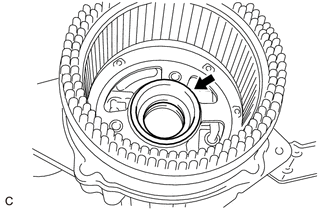 (i) Remove the pulley nut and generator pulley. (j) Remove the generator assembly from the vise. (a) Place the generator assembly on the generator pulley. (b) Remove the 3 bolts and generator rear end cover from the generator coil assembly. (a) Remove the terminal insulator from the generator coil assembly. (a) Remove the 2 screws and generator brush holder assembly from the generator coil assembly. (a) Remove the 4 through bolts. 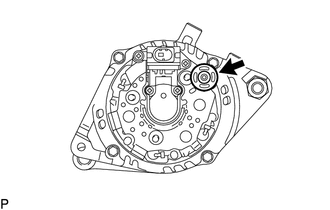 (a) Remove the generator bearing cover packing. 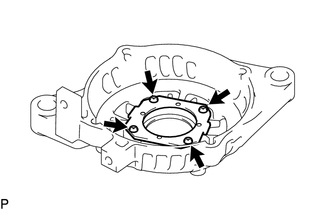 If the generator bearing cover packing breaks, remove all broken pieces. 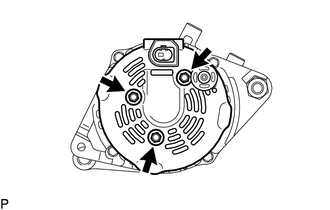 The generator bearing cover packing may be installed on the generator rotor assembly. 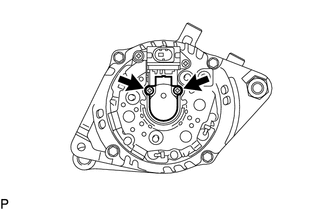 (a) Remove the generator rotor assembly from the generator drive end frame. 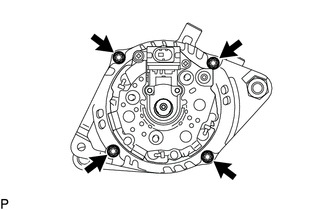 (a) Check that the generator drive end frame bearing is not rough or worn and that it rotates smoothly. If necessary, replace the generator drive end frame bearing. (a) Remove the 4 screws and retainer plate from the generator drive end frame. (b) Using SST and a hammer, tap out the generator drive end frame bearing from the generator drive end frame.